Can I Get a Podcast? 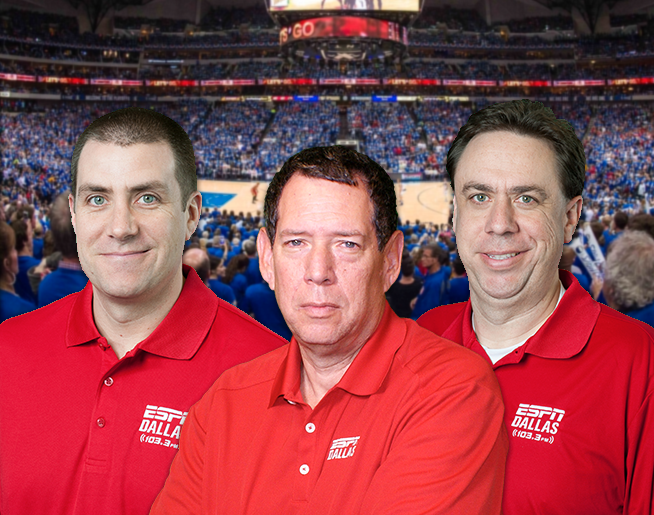 While others can only talk about the Mavericks and the NBA, only 103.3 FM ESPN can give you the real story with our team of Insiders. Tim MacMahon (Tuesday 4:10 / Wednesday 11:10) When a Mavericks story breaks, Tim MacMahon is usually the name that is breaking the story. Whether it be looming trades, a big free agent signing, or insight into what is going on inside the Mavs locker room, MacMahon’s segments are a must listen for every Mavs and NBA Fan. Chuck Cooperstein (Monday 10:10 / Thursday 4:10 /Friday 9:30) In addition to hearing him call every minute of every Mavericks game, you can hear Chuck Cooperstein every Monday and Friday on Jam Session. Chuck will also be making a weekly appearance on Dennis and Cowlishaw on Thursday afternoons to discuss the latest Mavericks and NBA storylines as well. Mike Peasley (One Hour Before Every Mavericks Game) Starting on hour before every Mavericks Game with Mavericks Insider, Mike Peasley, now in his 8th season as the Pre and Post Game Host, takes you inside the numbers of each matchup and gets the details on the Mavericks game at hand and the stories around the league with a rolodex of insiders at hand.